Last weekend, a bevy of elected officials and representatives from the Silver Spring Historical Society dedicated the Heritage Trail, a series of signs marking historic landmarks throughout Downtown Silver Spring. 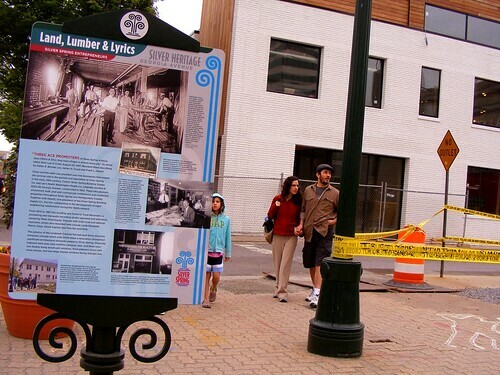 The first six signs have been placed along Georgia Avenue, noting places like the original location of Gifford's Ice Cream which opened in 1938 at Georgia and Sligo; the former Masonic Temple at Georgia and Wayne; and the Cissel-Lee Building at Georgia and Ripley, where the "Mattress Discounters" jingle was first recorded forty years ago. 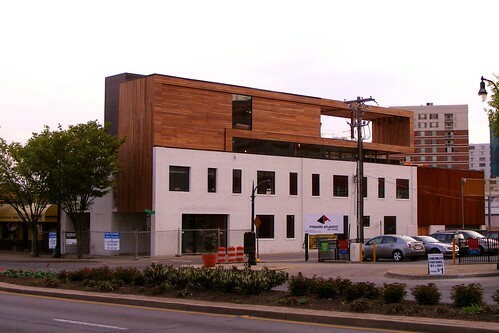 The Cissel-Lee Building, which dates to the 1920's, is undergoing a massive renovation. Future signs will commemorate the preserved façade of the Canada Dry factory on East-West Highway and the National Institute of Dyers and Cleaners at Georgia and Burlington, where dry cleaning was invented. 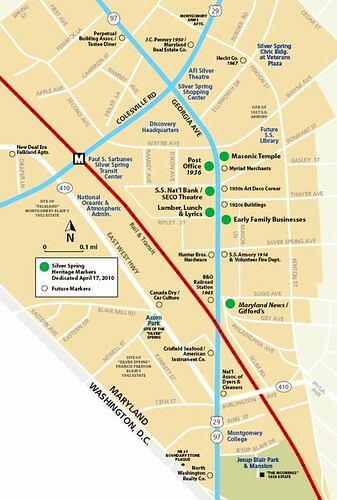 Here's a map of current and future signs on the Silver Spring Heritage Trail, which you'll also find posted on signs throughout Downtown. I've looked at some of the signs and I regret that they don't seem to have any indication of which way you're supposed to look to see the same view nowadays. That's the sort of thing that would make people feel the "living history" a little more if they don't already recognize the images and locations. When the Silver Spring Historical Society was preparing the text of the signs we were not quite sure which sides would be facing which compass direction much less exactly where in relation each sign would be to the buildings they were profiling.